SBIR-STTR Success: Ebert Composites Corp.
New technology that attacks the long-term maintenance problems of ground-based radar structures – and their associated costs – is translating to commercial success for a California-based small business. Ebert Composites Corp., with support from the Air Force Small Business Innovation Research/Small Business Technology Transfer (SBIR/STTR) Program, developed a method to improve the construction of protective shields for radar antennas that attracted a global business partner in the process. Also known as radomes, existing shields present several significant problems. They delaminate – in essence the layers of material peel apart – and require re-painting to continue to repel water. Additionally, the current crop of radomes are at a high risk of collapse from snow accumulation. Those maintenance challenges combine to cost the Air Force and other federal organizations millions of dollars per year. 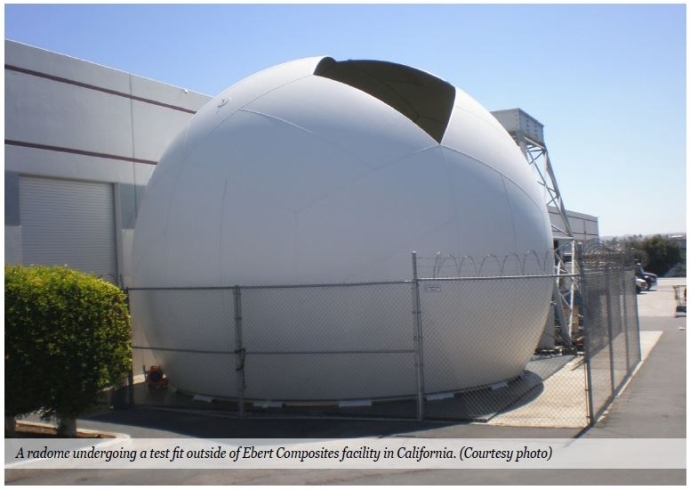 Based on its early success in addressing the delamination issue under the SBIR program, Ebert Composites was able to secure a Rapid Innovation Fund award to build and install a next generation radome at an Air National Guard facility in Connecticut. Saint-Gobain Performance Plastics assisted on that project and was so impressed with the result, it licensed the non-delaminating technology from Ebert Composites. Ebert Composites solved the delaminating issue by first developing robotic technology for inserting threedimensional fiber through sandwich structures in thermosets. The Air Force SBIR/STTR Program allowed the company to adapt this technology to the thermoplastic composites used to build radomes. Next, a permanent water repellent barrier was created by utilizing a fluoropolymer coated fabric made by Saint-Gobain. Ebert Composites' solution provides the structural strength for the radome while the coated fabric made by Saint- Gobain repels water, which could otherwise cause serious degradation to radar signals. Since the licensing agreement was signed, Saint-Gobain has invested approximately $5 million to prepare its existing Seattle-area facility and purchase equipment from Ebert Composites to manufacture the sandwich panels. That facility, which has been making radomes for aircraft, recently began production of radomes for ground-based systems. While the cost to make and install the new generation of radomes is comparable to that of legacy radomes, the average savings for maintaining each newer structure could easily top the six-figure mark during its lifecycle, according to Hobbs. Saint-Gobain is pressing forward to commercialize the technology, which includes discussions with the Air Force and other organizations that have a need to replace deteriorating radomes. An analysis from the early 2000s showed the Air Force could save more than $130 million over a 30-year period by mitigating the most pressing radome maintenance issues, according to David Lindquist, lead engineer for the tactical shelters, radomes and towers division of the Air Force Life Cycle Management Center. That prompted Air Force officials to approach industry for a better solution. However, radome manufacturers showed little interest in pursuing an upgrade to the technology at the time. The Air Force SBIR/STTR partnership with Ebert Composites appears to have hit the target. Barring minor issues, the new generation of radomes going into the field are expected to be maintenance free for decades.